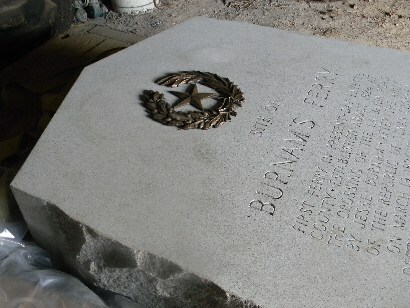 Burnam’s Ferry Centennial Marker Story. It started with taped-together scraps of topographical map quadrants found in the Winedale archives: a Native American archeological site marked in red on a terrace of Ross’ Creek where it formerly joined the Colorado River. Ross’ Creek is the next small drainage east of Cedar Creek, which forms Lake Fayette. The creek now runs down the southern loop of a cut off oxbow, and joins the river near the top of pioneer ferryman Jesse Burnam’s original league; the Indian site on the Ellinger side has probably been destroyed by gravel mining). Hello, what’s this? On another terrace, on the western side of the river, a small “x” in a circle and the words “Historical Marker.” What historical place or event could it commemorate to appear on a 50 year old USGS toporaphical map? A physical search revealed the marker was no longer in the indicated location on the old Burnam homeplace near Holman. What could have happened to it? A combination of research at the Fayette County Archives and consultation with Nesbitt Memorial Library (in Columbus) director Bill Stein revealed a partial answer to the mystery. The missing monolith was a grey granite 1936 Centennial marker signifying Burnam’s Ferry, where Sam Houston, leading the rag-tag Texas Army and a bunch of terrified settlers fleeing Santa Anna’s armies, had crossed the flooding Colorado River on their way east in early 1836. Burnam’s Ferry was a “gravel-bottomed ford.” The ferryboat was for high water. Jesse Burnam, an early Austin colonist, had erected quite a station, according to early observers, with a fine two-story brick house and store. He was a veteran of numerous fights with local Indians and, generally-speaking, not a man to mess with. The crossing was on a cutoff of the La Bahia Road, the main branch of which crossed the river at La Grange. After crossing his army, Houston ordered Burnam’s station burned, boat and all. Burnam never forgot. A couple of avocational local historians, one from Weimar and another from La Grange, decided that Houston Wade (and Julia Lee Sinks) were just wrong when they identified the original site of Burnam’s crossing. They thought it should have been several miles south at the other end of Burnam’s original league. 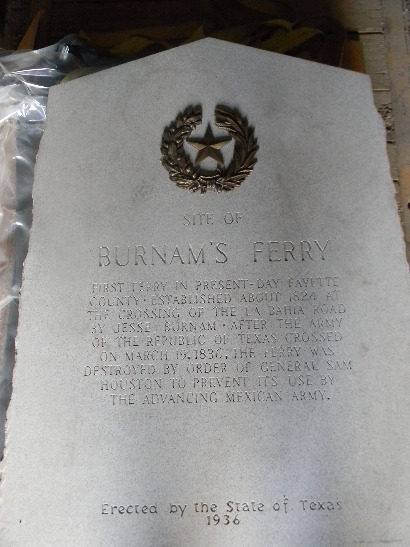 (Possible source of the confusion: Burnam did move to the other end of his property after the Texas Revolution and probably had a ferry there). Getting a verbal OK from the Fayette County judge at the time and enlisting the financial assistance of Colorado County commissioners, the two revisionists engineered the removal of the monument to Colorado County where the original inscription was ground off and replaced with language locating the crossing site near Weimar (suspiciously near the birthplace of the Colorado County man). Dennis explained that the THC decided that the Colorado County information, even if incorrect, had became part of the history of the monument. (It had, after all, been on the monument longer than the actual Fayette County text). After much deliberation and persistence by Dennis and County Judge Ed Janecka,, the THC agreed to allow the monument to become the only two-sided 1836 Centennial marker in the State of Texas. “Notably, the Fayette County side will become the new front side and will include a ‘Returned to’ date,” Dennis said. The bootleg revision on back side will retain the (incorrect) Colorado County information which was incised after the original inscription had been ground off. (“Bootleg,” because the marker properly belongs to the state, which did not give permission for its removal or alteration). After what Dennis calls “a long and winding road,” the monument was brought back to the county late last week. In 2009, the county reacquired the monument and moved it to Austin, from whence it made another move to Marble Falls to have the “back” (new “front”) refinished and polished. It was then taken to Stasswender Memorials, where the freshly polished stone was etched with the original information about the significance of the ferry crossing. Then, about six weeks ago, Rodriquez Brothers Memorials in San Antonio was commissioned to make the wreath and star. 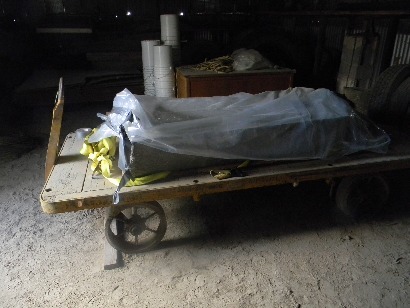 Last week, Dennis delivered the completed wreath and star to the foundry where they were attached to the monument. “Not only will this be the only two-sided Centennial monument in the State, but it will probably be the most traveled,” Dennis said. Plans are for members of the Holman and Burnam families to attend rededication ceremonies in early October, along with area 7th-graders who are studying Texas history and members of the public. Sidebar: Donations are needed to help pay for the Burnam Ferry Re-Dedication Ceremonies and a Reception. Please contact: Linda Dennis, Chairman, Fayette County Historical Commission at: Linda_J_Dennis@yahoo.com or call (979) 378-2019 if you can help. FIRST FERRY IN PRESENT-DAY FAYETTE COUNTY. ESTABLISHED ABOUT 1824 AT THE CROSSING OF THE LA BAHIA ROAD BY JESSE BURNAM. AFTER THE ARMY OF THE REPUBLIC OF TEXAS CROSSED ON MARCH 19, 1836, THE FERRY WAS DESTROYED BY ORDER OF GENERAL SAM HOUSTON TO PREVENT ITS USE BY THE ADVANCING MEXICAN ARMY.